I had the chance to sit down with the venerable Tony Smith of Lima Smith Lda., which owns Quinta de Covela and Quinta da Boa Vista of northern Portugal. This was a unique opportunity to sit down with this former editor, previously based in the UK, of Conde Nast and discuss how he went from being a editor to the owner of these prestigious properties in the Douro River Valley. Tony went from living in São Paolo, Brazil (population: 58 million), to São Tomeo (population: 681). In the interview, he talks about his experience with this change as well. Lima Smith Lda. is the brain child of Tony Smith and Marcelo Lima. They both initially purchased Quinta de Covela through an auction in 2011. They later went on to purchase Quinta da Boavista, a former Offley estate from Sogrape Vinhos, in 2013, and also took over the Quinta das Tecedeiras brand. I had the opportunity to visit Quinta de Covela and stay on the estate. It had the most gorgeous views of the valley and was situated in the middle of the Vinho Verde region of the Douro River Valley. The estate has 70 hectares, with approximately 20 hectares-49 acres of vines under production, with another 50 hectares available to plant. Right now their current production is about 100,000 bottles—8,333 cases of 12 bottles—annually. Dating back to the 1500s, the estate was formerly known as Casa de Covela, where, to this day, the ruins of the old stone Renaissance manor home still remains. The estate went on to belong to various owners, but in 1980s it was acquired by the businessman Nuno Araújo, who created the brand Covela. In 2007, Casa de Covela gained the classification as a bio-dynamic producer, which at the time was above and beyond what others in the region had done. Unfortunately, the estate was later abandoned, and when the property was first purchased in 2011, it was in disrepair and in need of a little TLC. After two years of neglect, Lima Smith picked up the winery and, resurrecting it, refocused it from 50/50 red-to-white production to 20 percent red and 80 percent white under the direction of renowned winemaker Rui Cunha. Rui had been involved in the original project back in 1992 and later returned to help revive this beautiful property; he also has a consultancy and makes his own wines through Secret Spot. Rui made the decision to return to help rebuild Covela because he could finally make the wines he always wanted to under the new ownership. 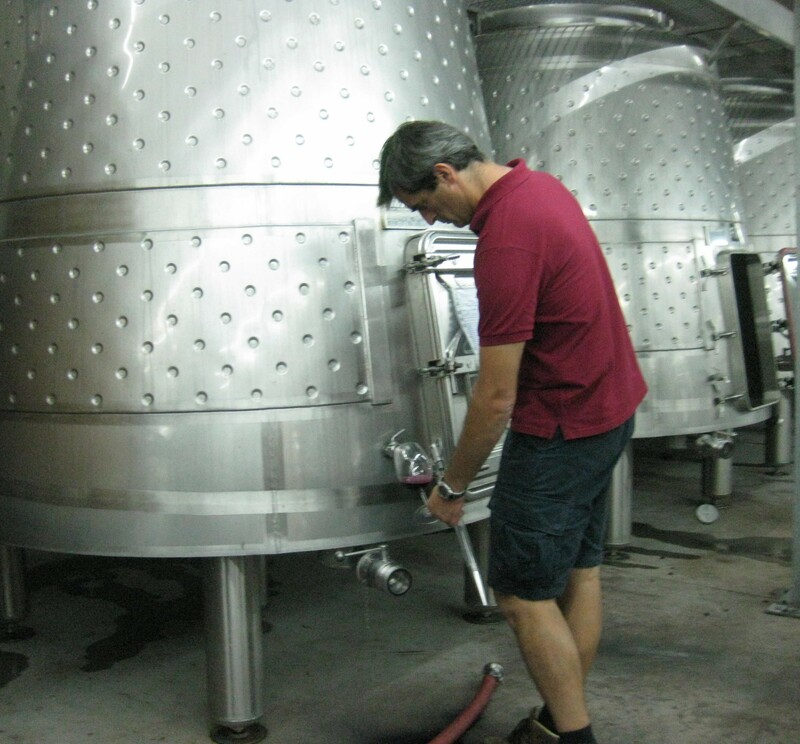 When he came back to Covela, he was able to make a single variety wine out of the Avesso grape variety, which has now gained national acclaim. This grape variety wine turns out to be one of my favorite Vinho Verdes. Wine Notes: Avesso 2012 Edicion Nacional. Covelo- first vintage. It has a touch of baked goods with a crisp lemon-lime mouth; it is dry and delicious. The winery has sold its wines mainly in Portugal in the past, but its focus for the future is to sell 40 percent of their wines nationally and sell 60 percent internationally, first into 3 new markets opened this past year: US, Brazil, and Germany, with plans for three other new markets. In recent news, Quinta de Covela was just awarded the Trophy of “Best Viticulture” at the annual 2014 gala of “The Best of the Year” organized by Revista de Vinhos magazine. This is one of the most prestigious awards of the wine and gastronomy industry in Portugal. Congrats! This concludes my series on Portugal. Next up is Portland and the urban winery movement as well as additional regions of interest in Oregon. If there is something you are interested in learning about tweet me @SacredDrop or leave a comment below. Thanks for joining us! Make sure to sign up to receive notifications of newest posts by email. The Douro River Valley has steep and twisting canyons that have been sculpted over the years into terraces by hard-working farmers. The birthplace of port wine, the Douro River Valley was demarcated in 1756 by the Marquis of Pombal and is one of the oldest regulated wine regions in the world. It is also one of the most beautiful regions in the world to visit. Indeed, this spectacular region was classified as a UNESCO World Heritage site in 2001. It’s not surprising, given the history and beauty of this place. I was rendered speechless by the majesty of this region, this valley of gold, and what it has to offer. While there are numerous theories on why this region was called Douro, the name might be traced to the Celtic god of water Durius, or perhaps to the phrase “De ouro,” which means “gold” in Portuguese. Either way, this region is a region of many riches and experiences to be had. While this valley is known primarily for its port wine, it is now starting to be recognized also for its high-quality table wines. All of these wines come from the terraced vineyards of Portuguese grapes, such as you can see in the photo below. The Douro River actually begins in north central Spain, where it is called Duero; it then flows from there to Porto, Portugal, where it is called Douro. How to get there: As you can see from the map below, the easiest way to get to the Douro River Valley is actually via a flight from Lisbon to Porto. Then you can travel by boat or train to Régua or Pinhão, the two most popular cities of the Douro River Valley. Plan on spending at least two days in this beautiful valley. Port wine enthusiasts will likely want more days to visit all the beautiful Quintas (country inns or estates) along the river. When planning your trip from Porto, it is about two hours in car, or two to three hours by train, to the cities of Régua or Pinhão. It is advisable to visit during the week, since weekends in the summertime may be quite busy. Where to visit: Quinta de Covela– S. Tomé de Covelas My recommendation would be to take the train from the São Bento station in Porto directly to Régua. While in Régua, stop off and visit the Vinho Verde region of the valley. Visit Quinta de Covela, where some of the best tasting Vinho Verde is made. (The direct translation of vinho verde is “green wine,” otherwise known as white wine.) 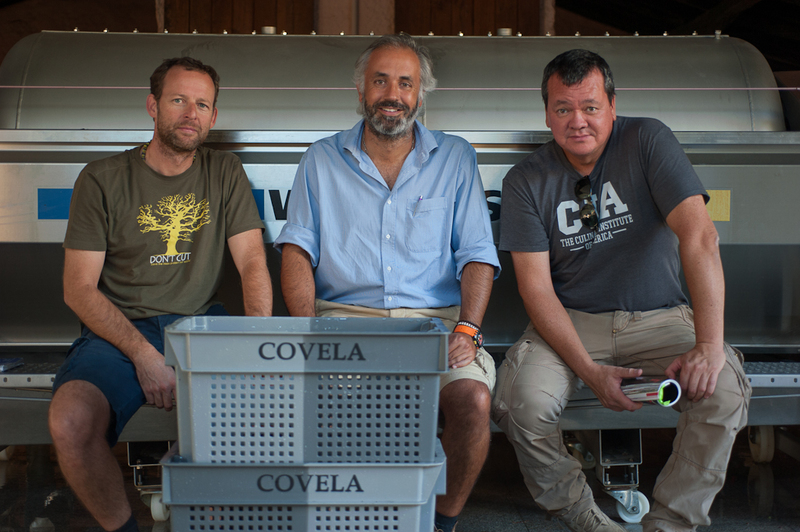 Under the management of Mr. Tony Smith, part owner of Quinta de Covela, and renowned winemaker, Rui Cunha, Quinta de Covela has come back from near ruin to prosperity. 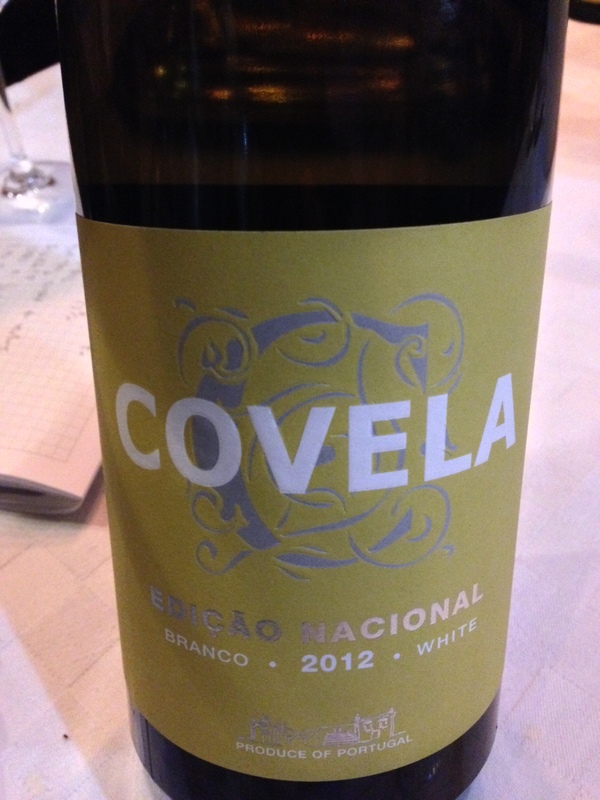 Their award-winning wines are making strides in the wine world—in particular, their Covela Escolha Branco 2012, and my personal favorite, COVELA Edição Nacional Branco. This last wine is made with 100% Avesso grapes. I had the pleasure of enjoying their wines and their beautiful Quinta this past fall. I even had the chance to go running with the Covela dogs, Teddy, Alef and Spot, through the small towns of Portinha and Covelas. Stay tuned for my interview with Mr. Tony Smith. Quinta de Napoles– Niepoort Winery in Santo Adrião Niepoort, while well-known in Portugal for their high-end quality Ports, their modern still wines are stunning. I have yet to have a Niepoort that I haven’t thoroughly enjoyed. This beautiful Quinta de Napoles is situated in the town of Santo Adrião and has a brand new facility with state of the art equipment and a spectacular view of the valley. If not for the wines, come for the view. One of the most beautiful times of the year to visit this region is during harvest, usually around September of each year. If you happen to visit during this time, I recommend taking a three-hour boat river trip along the Douro River, starting in the morning to mid-day, and departing from Pinhão. You can take the train back to Regua and spend the evening at Quinta Sta Eufêmia, where you can experience grape stomping in traditional lagares (a large, typically stone trough in which grapes are stepped on and pressed, separating the grape skin from the pulp to create must, grape juice). When I first came here with the University of La Rioja as part of my master’s program in viticulture and enology, I left with unforgettable memories, including wading in grapes while dancing to accordion and drums at Quinta Santa Eufêmia Winery in the Douro River Valley. Take a look! tel. : +351 254 858 123, e-mail: doc@ruipaula.com. Every small plate was paired with a regional wine. Needless to say, there were many glasses of wine and many, many memories to pair it with. Here is an example of their version of Terra/Mar or Surf and Turf. All I can say is that it was one of the best meals I had ever had in my life. If all of this isn’t reason enough to visit, I don’t know what is. Time for you to add this beautiful valley of gold, the Douro River Valley, to your list of must-see places! Note: It is highly recommended to call or e-mail for reservations at this world-class restaurant. If you are interested in having me lead you through a tour of the valley to a number of unforgettable Quintas in the Douro River valley, please contact me to discuss options. To learn more about the Douro River Valley, stay tuned, because this is the next article in my series on Portugal. Chin Chin!